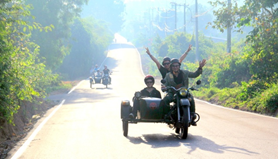 to cruise to Cu Chi district approximately 70 km from Ho Chi Minh City. they make rice paper and copy it. 10:00am arrive Cu Chi tunnel . 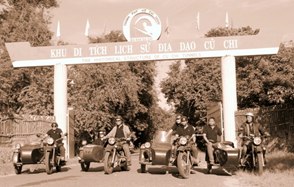 In their hay day the tunnel system stretched over 250km long in all over Cu Chi district . The three leveled network included innumerable trap doors, specially constructed living areas, storage facilities, weapons factories, field hospitals, command centers and kitchens. Today the remaining tunnels have become a major tourist attraction giving you a unique experience and a feel of what underground life in the American war must have been like. The tunnels have been widened for our benefit (otherwise westerners would not be able to enter them!) . 14:30 Lunch at local restaurant ,on the way back . drop off point of choice.